Squash Blossoms abound here in Spring and Summer. Not surprising since the squash is native to Mexico where the flower, Flor de Calabaza, has many delicious uses in tamales, quesadillas and soups. The Europeans fell in love with them and were delighted that this little squash travelled well. It became “Zuchinni” in Italy and “Courgette” in France. Here, in its native ground, we call it “Calabacita.” The scientific name of the squash is Curcubita pepo. This particular species, whose flower has a subtle flavor, can be eaten both raw and cooked. That pistil that you see inside the blossom should be removed after you gently wash the flower. I use scissors to snip it. Today I’m filling the blossoms with cheese and lightly sautéing them. I serve them with a Poblano salsa that ratches up the flavors of the filled blossom. Pop them up for parties or serve as a first course. The Panela cheese does not melt and drip away but holds its structure. You could also use Mozzarella or even Ricotta if you can’t find a Mexican cheese like Panela. I add Texas Mexican Oregano for an aroma that’s great with the green onions. I hate to be a stickler, but it’s worth the effort to search for the Texas Mexican oregano that is naturalized throughout Texas and Northern Mexico because it’s more subtle and goes well with the delicate blossom. It’s easy to find online and easy to grow. Here’s what it looks like. Use just the leaves. Recipe adapted from the book, “Truly Texas Mexican: A Native Culinary Heritage In Recipes” published by Texas Tech University Press. 1. Boil the Poblano chile, garlic and onion in the water until fully cooked, about 15 minutes. 2. Drain and place them in a blender along with the pumpkin seeds and salt. Purée until completely smooth. 3. Add the lime juice, adjust the salt as needed and set aside. 1.In a skillet heat the olive oil and then add the onions and cook in medium heat until they are translucent, about 2 minutes. Remove from the skillet and set aside. 2. In a bowl combine well the onions, oregano and cheese. 3. 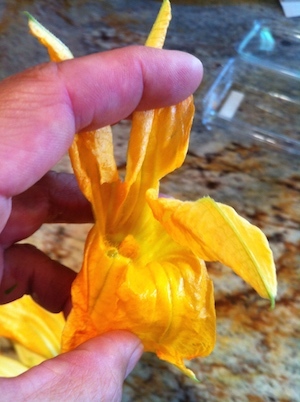 Fill each squash blossom with the cheese mixture. Carefully close each and set aside. 5. In batches, add the squash blossoms and lightly sauté them on two sides, using a spatula. Add the additional olive oil as needed. 6. If serving as a first course, transfer them to four plates and spoon the Poblano salso alongside. Ay Dios mío, que maravilla! Ymm ymm. Quesadillas de flor de calabaza! But where do you get the flor?